I was given a wonderful word to describe the Californian Poppies I wrote about the other week – unfolding, so thanks go to Walking In Beauty . The word triggered other thoughts about unfurling and unfolding. I have a soft spot for ferns in the garden with their life span of dying back in Winter to emerge once more in Spring and to fill out in Summer and then to retreat into Autumn and back into Winter. Somehow they seem primeval to me, ancient looking, as if nature hasn’t changed one iota since this world was created or dinosaurs roamed. 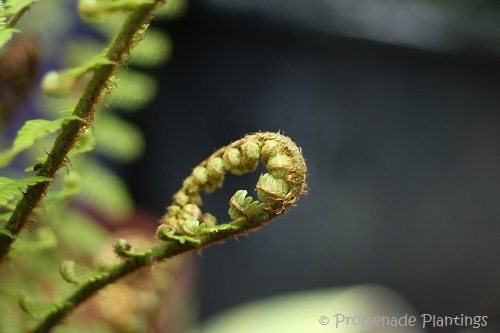 Today’s photos are of a favourite fern growing in the garden, its label long lost in house moves and garden re-shuffles. It’s not a fancy schamncy tree fern, doesn’t have particularly special foliage. To me it is beautiful. 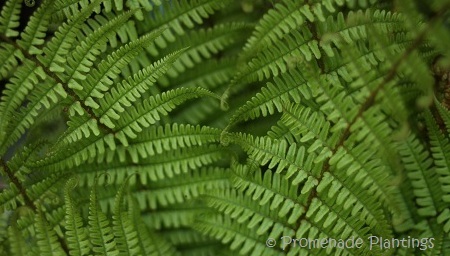 Its acid green fronds unfurl from tight brown buds close to the base of the plant. I watch this show every year with never ending pleasure. This ancient species is a perfect foil against the backdrop of our also ancien cobbled (pebble) walls – a tad younger as they were built over 180 years ago, who knows how old the pebbles are? And as the sun comes out and the days get warmer I feel like I’m unfurling and unfolding too from the cold and wet of Spring and Winter. We have tulips in the backyard and I just love watching how they open up for sunshine but close at night – beautiful! Magical is a great word. I love flowers that close at night, so clever of them ! I too love Ferns…so cool and fresh looking. I put one in a pot by the back door yesterday. And you – I got here from Celi’s blog, what a lovely place that is! celi’s blog is special through and through ! Thanks for your wonderful photos. Hi Marie, and you are so welcome. I love nothing better than seeing ferns in their natural settings like woodlands or grassy banks or as you so eloquently expressed it “magical forest glades and cool, mirror-still ponds”. delightful! Ferns have a beauty all their own. They’ve been a lifetime favourite of mine and I love seeing them unfold every Spring. They remind me that no matter how tightly we hold on to the tender parts of our self, there comes a time to open up and bless the world with our presence. It’s a great close shot. I like such detail and always surprised wonderful nature things. Thank you Cocomino, I think close up shots are my favourites, noticing the wonderul detail that is nature. Absolutely magnificent shots!!! What lens and settings did you use to take them? You should enlarge and frame them all for your home – exquisite. I too love ferns and we have three tree ferns and a couple of other varieties in our lapa area. I’m sure those tree ferns look magnificant in your garden Mandy! As to the lens and photo.. I need to go and double check…. back shortly! Sorry that wasn’t so shortly – life catches up sometimes! Does that help at all ??? Well, Claire, I can now say I have never given ferns their full due. I have appreciated them for their ability to cover the rubble and beautify the view into the woods. I have welcomed the little curls that show themselves first in the springtime, as I do anything that marks warmer weather ahead. That was about the extent of it, until I read your post today. They really are a jungle plant, aren’t they? I can picture them, too, with dinosaurs and ancient beasts! They really are quite beautiful, and amazing. Thank you! Thank you Cindy, I wasn’t sure if it was my over active imagination at work with the dinosaurs but in my mind I see them 🙂 And I’m so pleased you liked them, I nearly forgot to post them (been a busy few days) !! Oh no more posts to add to the ”posts still to write” list:-) But come to think of it one is already (briefly) in a post! Ferns look a little reptilian when they are curled, I think. My mother is quite fond of them. But I do see your connection. I always enjoy hearing an artists impression or interpretation of life around us, and you always provide me a fresh look, thank you! I absolutely love ferns and feel the same as you about them. My favourites are the shuttlecock fern with its upright lime green leaves looking just like a shuttlecock and the painted lady fern sort of red/purple and silver leaved. These die down in the winter and unfurl as you say in the spring and multiply all over the place they are gorgeous. I have a rather beautiful tree fern to, I also have. a giant king fern the leaves are about 6ft in leangth. There is a fern for nearly every location, they even grow out of walls with no soil, what a great species of plants. Your ferns sound splendid – I like the sound of the Giant King Fern, I need to take a look at that, I like to have ferns in the garden at home, they have a cooling frothy feel to them. Wow. What patience you had to get all the shots of the unfurling! 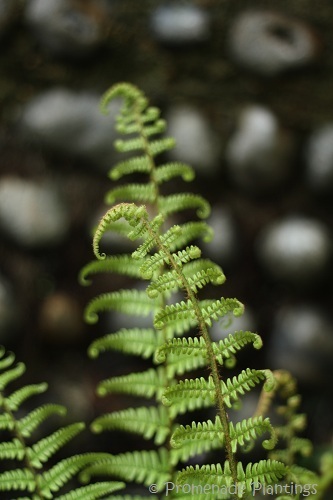 Very beautiful shots – it sounds like a lot of people agree and also love ferns! I was reminded of a fantastic place on the Isle of Wight which was (maybe still is) a walk down to the beach through what feels like a forest of ferns, shade, sun, water…so lovely! Walking to the beach through a forest of ferns sounds idylic to me Tanya, much nicer than here in St Leonards!! Thank you Nia, your encouragement as ever is gorgeous! Although I’m not 100% certain, I think this is a Lady Fern, aka Athyrium Filix-femina. Maybe someone else will know for sure, or correct me if I’m incorrect? Great pics! I googled images for Lady fern and it does look very like it. So straight to the top of the class for you!! Isn’t blogging the best?! Great photos, as usual. The ferns are both organic and geometric. You also capted the color very well.. 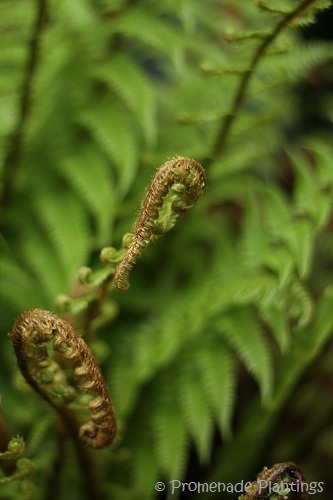 Fantastic links and connections, both the fiddleheads and the Fibonacci series. Clever connections and clever old nature. Thank you so much! When we moved into our current home we planted many ferns along the front, shady side of the house. The ferns are all well established now and unless we have a winter with many freezing nights, do not die back each year. The most magnificent are the tree ferns that have grown from a foot high to almost roof height. They evoke a primal forest just outside our windows. 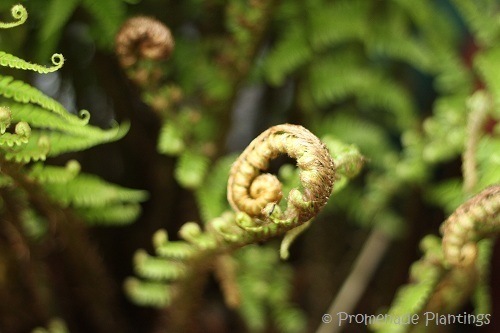 We also enjoy the unfurling of their majestic fronds! a lovely post, thank you Claire! Just beautiful, Claire! They really are dinosaur plants, aren’t they! Aren’t they just – one of the oldest plants on our planet! Hi there Noodle, gorgeous to see you. I’ve never been to singapore, but knowing a bit about it’s climate I can imagine the greenery would be spectacular. Beauty undone. Well done, Claire. 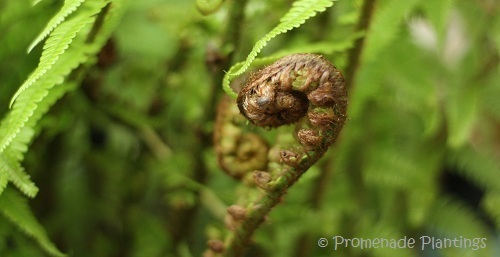 “Primeval” does come to mind when seeing fern fronds starting to unfurl. And large, well-maintained ferns can be so beautiful. They can turn a dark part of a garden into a lush-looking bed. Lots of these ferns are on the perimeter of our Maine property, and I have no idea how they got there. Ferns seem to have a way of springing up anywhere, and I am delighted by their variety. Many of ours are now in the process of unfolding, and I agree, the process is lovely. Hi the ferns you describe in Maine sound so lovely! I like them for the fact that they are easy gardening – little or no work! Isn’t gardening all about unfolding and unfurling? Great words to use. Beautiful ferns by the way. I agree with you completely..ferns are so wonderous! Lovely photos, ferns are one of my favorites.